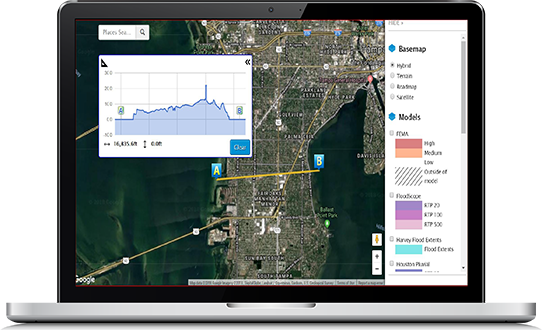 InsitePro is a cloud-based software solution that brings together all the necessary data and analytics for underwriting natural catastrophe risk, anywhere in the world. Each insurer has a different perspective on how to assess natural catastrophe risk when underwriting. That’s why InsitePro lets you design the risk scoring analytic that meets your needs. Of course, InsitePro includes Intermap’s best-in-class geospatial data, but we also let you add your proprietary information for a risk score that’s customized to your company’s strategy and history. Because InsitePro is customized to your needs, you can also select the scoring output that best fits your business. Choose from a numeric score (0-100), a color-coded score (stop light), a specific activity such as underwrite or don’t underwrite, or a simple go/no-go alert. What’s the difference between their 10-meter resolution and NEXTMap® 1-meter resolution? It could be the difference between whether a property will or won’t flood. For years, InsitePro has relied on the unparalleled accuracy of Intermap’s 5-meter NEXTMap terrain data. We’re now introducing NEXTMap 1-meter data into the InsitePro dataset for the continental United States. InsitePro reveals hidden underwriting gems in areas previously avoided by commercial insurance firms – enabling companies to broaden their portfolios while reducing risk. NEXTMap includes water flattening and hydro enforcement – one of the most important characteristics of an elevation dataset used for flood applications. Without comprehensive hydro enforcement, flood risk predictions could be flawed or misleading because you have to accurately characterize the water before you can understand where and how it will flow. Nowhere is the difference more evident than in the popular vacation area of Hilton Head Island. The example below highlights a cross section of the island where the difference between InsitePro and the NED elevations can be as much as a 3-meter difference – which can mean the difference between profit and loss when insuring properties on a barrier island (blue line represents InsitePro)..